With a Dangerous Method hitting UK cinemas today, Lionsgate has just sent over a clip to wet your appetite. Viggo Mortensen and Michael Fassbender star in director David Cronenberg's adaptation of Christopher Hampton's play detailing the deteriorating relationship between Sigmund Freud and Carl Jung as they contend with a particularly troubled patient. Carl Jung (Fassbender), a disciple of Sigmund Freud (Mortensen), is using Freudian techniques to treat Russian-Jewish psychiatric patient Sabina Spielrein (Keira Knightley) at Burghölzli Mental Hospital. But the deeper Jung's relationship with Spielrein grows, the further the burgeoning psychiatrist and his highly respected mentor drift apart. As Jung struggles to help his patient overcome some pressing paternal issues, disturbed patient Otto Gross (Vincent Cassel) sets out to test the boundaries of the doctor's professional resolve. Meanwhile, Jung and Freud's continued sessions with Spielrein lead to a series of profound breakthroughs in the methods that doctors use to treat their patients. 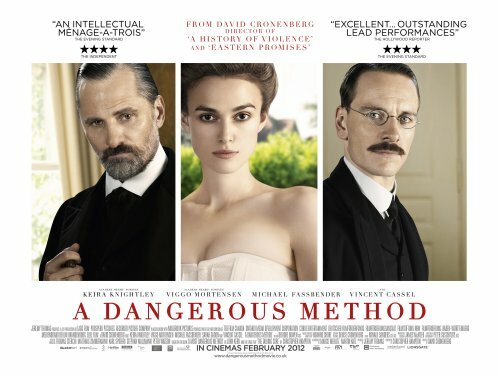 A Dangerous Method is in UK cinemas now.